In honor of the 26 who lost their lives at Sandy Hook School in Newtown, Connecticut, Linda Tillery takes the Freight stage with her friends to remember the children who perished and promote the safety of all children in a family friendly performance and sing-along guaranteed to lift the spirits. The show features Linda on vocals and percussion, Evie Ladin on vocals and banjo, Ray Obiedo on electric guitar, Barbara Higbie on vocals, David Belove on electric bass, Deszon Claiborne on drums, Tammy Hall on keyboards, and Unique Derique providing comedy and clowning. 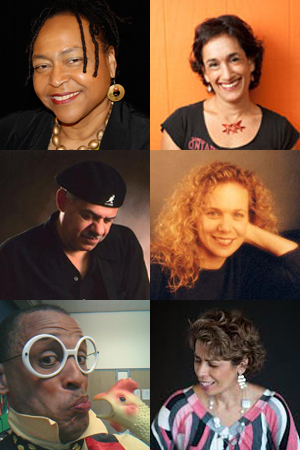 A central figure in the women’s music movement of the 1970s and 80s, Linda Tillery was also a founding member of Bobby McFerrin’s vocal ensemble Voicestra. She leads the Cultural Heritage Choir, performing African American roots music. Evie Ladin is a banjo player, step-dancer, singer, and songwriter. A vital member of the Stairwell Sisters, Keith Terry & Crosspulse, and the Evie Ladin Band, she’s won acclaim for her singing, songwriting, and performing. Richmond native Ray Obiedo is a jazz and R&B guitarist. He’s recorded with Herbie Hancock, Julian Priester, and Sheila E, and led the groups Kick and Rhythmus 21. Barbara Higbie is a master of piano and fiddle who composes beautiful music and sings like a dream. David Belove is a monster bass player who plays with the Wayne Wallace Quintet and the Oakland Interfaith Choir and has worked with Tito Puente, Pete and Sheila Escovedo, Dizzy Gillespie, and Pat Metheny. Emmy-winning clown Unique Derique is internationally known for his circus skills, hilarious physical comedy, and mastery of the style of body drumming popularly known as hambone.